(Nanowerk Spotlight) There you are - a romantic dinner for two, soft jazz music in the background, exquisite French cuisine served on finest porcelain. You are sniffing that 1986 Bordeaux you kept for this special occasion. The expensive floral bouquet that is the centerpiece of the table is warmly lit by several candles. "Wait!" you think, "wouldn't the soot from these candles make a great source of fluorescent carbon nanoparticles?" Or so works the mind of a nanoscientist. This is why they make great discoveries in nanotechnology while you and I just waste a few hours on dinner. Researchers actually have just demonstrated that fluorescent nanoparticles can be prepared from a common carbon source - candle soot. The whole process is so simple it could be carried out in a freshman chemical laboratory. So chances are the dinner actually was a midnight snack over pizza and diet coke, the music was Talib Kweli, and the mood was decidedly unromantic. It hasn't been long since carbon nanoparticles, also called carbon dots, a new class of carbon-based nanomaterials with interesting photoluminescence properties, were isolated (for example, see our Spotlight from March "Single fluorescent nanodiamonds as cellular biomarkers"); and only recently have they been developed and used as a biological probe without fluorescence dye labeling (unlike that of carbon nanotubes) for in vivo applications. "These carbon nanoparticles are either nanodiamonds or materials derived from carbon nanotubes and the laser ablation of graphite" Dr. Chengde Mao explains to Nanowerk. "Unlike fluorescent semiconductor nanocrystals (quantum dots), the fluorescent carbon nanoparticles (CNPs) have only been poorly studied up to now because of the lack of preparative methods and separation techniques. We have now developed a method for efficiently preparing and isolating fluorescent CNPs from a common carbon source, namely, candle soot." 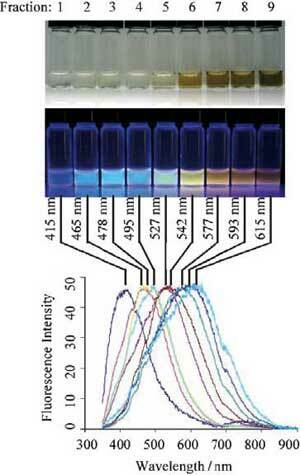 Mao, an Associate Professor in analytical chemistry at Purdue University, and his team chose the following approach: 1) The preparation of fluorescent CNPs from the combustion soot of candles by means of an oxidative acid treatment and 2) the purification of the fluorescent CNPs by using polyacrylamide gel electrophoresis (PAGE). "Incomplete combustion produces CNPs with diameters of 20–800 nm" says Mao. "These particles strongly interact with each other to form agglomerates of several micrometers. To break down such inherent interactions and produce well-dispersed, individual CNPs, we adopted an oxidative acid treatment, which is commonly used for the purification of carbon nanotubes." Scientists of course are aware of the fact that semiconductor quantum dots contain metals that are intrinsically toxic, such as cadmium. Leakage of such metal ions is a serious concern and therefore not really well suited for biological applications. Most researchers acknowledge the need for finding better, particularly environmentally friendly, fluorescent probes. Carbon nanoparticles are obvious choices because they don't have intrinsic toxicity. As potential fluorescence labels, the small CNPs are expected to interfere to a much lesser extent with the biomacromolecules, or with the biological processes under study, as other bulky quantum dots. The specific problem that could be solved with these carbon dots includes tracking of a single fluorescent CNP carrying target molecules during the course of cell differentiation and development in three dimensions. These processes usually take hours to complete and cannot be monitored continuously using conventional fluorescent probes. How a virus affects a cell is another problem that can be solved with fluorescent nanodiamonds. The most important potential biological applications of fluorescent CNPs include (1) biomolecular labeling, (2) cellular imaging, (3) tumor targeting, (4) single particle tracking, (5) long-term in vivo monitoring. Mao points out that the nanoparticles are stable for several months under ambient conditions and can be excited by a single-wavelength light, thereby emitting multiple colors. "The CNPs contain carboxylic acid groups on their surface, which allows functionalization with biomacromolecules through N-hydroxysuccinimide (NHS) chemistry" says Mao. "Our method provides a convenient way to prepare CNPs by using a common carbon resource. The most immediate questions we would like to address now are: What are the exact chemical identities of the CNPs? What is the luminescence mechanism? Can we use the fluorescent CNPs for biosensing?" The current carbon particles also have quite low quantum yield and improving the yield yield is an immediate challenge for Mao's team. A paper on this research ("Fluorescent Carbon Nanoparticles Derived from Candle Soot") has recently been published online in Angewandte Chemie International Edition.